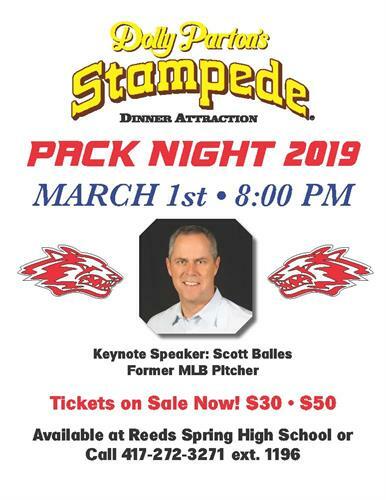 The Reeds Spring R-IV School Foundation is thrilled to announce its ninth annual major fundraising effort: “PACK NIGHT at Dolly Parton’s Stampede Dinner Attraction” on Friday, March 1. Pre-show entertainment begins at 7:10 p.m and the main event begins at 8:00 p.m. All of the evening’s proceeds will benefit the Reeds Spring R-IV School Foundation, which focuses on granting continuing education scholarships to Reeds Spring students and classroom enrichment mini-grants to teachers. At this year’s event, renowned baseball pitcher Scott Bailes will deliver a short keynote address about dedication and rising above average. Bailes, who attended Parkview High School in Springfield and Southwest Missouri State University (Missouri State), played nine seasons in Major League Baseball. He began his career with the Cleveland Indians and also spent time with the California Angels and Texas Rangers. Bailes is still involved in baseball as a broadcaster for the Springfield Cardinals. His broadcast partner, Ned Reynolds, will join Bailes at PACK NIGHT for a very special introduction. Reynolds is a Missouri Sports Hall of Fame inductee who has been broadcasting sports in the Ozarks since 1967. Tickets for the event are divided into two categories. The general admission tickets, which include the entire Dolly Parton’s Stampede show and meal, along with the keynote speech by Scott Bailes, cost $30. VIP seats will be located closer to the arena floor and are $50 each. Individuals who purchase VIP tickets will have the opportunity to attend a meet-and-greet reception at 6:30 p.m. with Scott Bailes and Ned Reynolds. They will also receive an autographed photo and be entered for a chance to win some amazing door prizes. 100% of the money raised will benefit students. Tickets can be purchased at Reeds Spring High School or by calling Gibson Technical Center at 417-272-3271 ext. 1196. 1525 W. Hwy 76 Country Blvd.